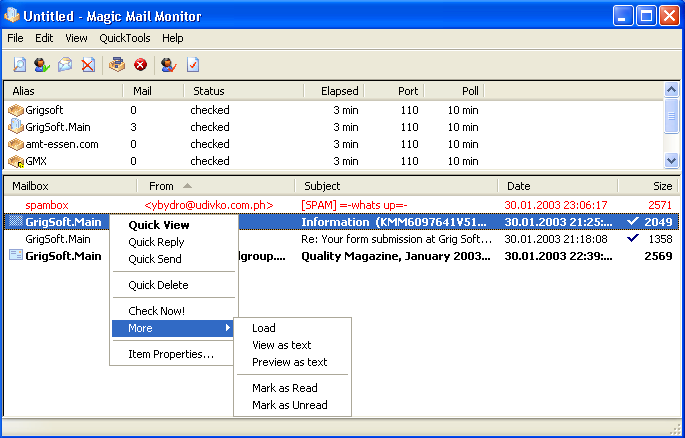 Magic Mail Monitor is a POP3 mail monitor with multiple accounts support. It sits silently in your system tray and notifies you about new messages in one of your mailboxes. Then you can preview messages and delete unwanted mail in order to avoid spam and viruses. Used to be good, but nowadays I prefer nPOPUK. MMM supports multiple language interface. Check out available dictionaries here. Or create your own translation! I've been using M.M.M. with FreePOPS (http://www.freepops.org/) for many years to monitor all my pop3, gmail and hotmail accounts. M.M.M. beta 14 and 15 keep crashing while doing that, so I'll stick with beta 13 which works like a breeze! This version works well now but I don't notice any difference between it and beta 13. The filter function works fine now. I have used this in several machines over the last 4 or so years. Works fine, easy to set up and easy to use. Why does every single developer who makes a mail monitor program insist on putting an icon in your system tray when you *DON'T* have any new mail? For years now I've been looking for a mail notifcation program that behaves in the same way as Outlook (i.e. no email = NO icon, new email = display an icon) so that I can be notified of mail without having to leave my email client open. But I have never found such a program (desite trying out dozens of mail notifcation programs over the years). I know that most software writers have a "tray icon fetish" and will find the lamest excuses to put an icon in the tray (just to show off that they've figured out the necessary hooks to implement this), but system tray abuse is getting quite ridiculous now. Plus, more and more mail "monitor" programs are evolving into poor email clients. There is a total lack of development of options / customisation for the notification itself (thereby ignoring the whole point of the program) and instead they add more and more email client type features; like full HTML message reading, editing and reply etc. I don't want to read, edit or reply to my email from the notifier (that's what I have an email client for) I just want it to nofity me (and give me a LOT of choice about how the notifcation is done - i.e. user chosen tray icon, whether to pop up a 'toast', user chosen sounds etc.). On the upside, this program has paid some attention to the interface and it looks a whole lot better than many other programs I've seen on SourceForge. Not a bad program, but with the rare updates and current bugs, I would recommend you try PopPeeper ( http://fileforum.betanew...POP_Peeper/1040166580/1 ). It is frequently updates, light, and has all features you may need for a program of this type. I have been using Magic for a while now and it suits my needs perfectly. I used to have Mailwasher Pro but that got to be too "bulkey" after a while. Most of these spammers change e-mail address every day anyway so one hardly needs the overhead of checking thousands of blacklisted names which no longer exist. The human mind is still superior to the computer. It's simple and it works. Great program. Discovered this tool while it was new, many years ago. It was always on the "test-list" of email tools that was evaluated, but a year ago – after it’s latest development, it became the default mail checker. Still I wish for some few tweaks, small but still it would save a LOT of work with all the Spam out there. Using a list where nearly all mail that’s not defined as "friends" automatically are listed as "Spam", so all real mail must be added to "friends" – and in addition same mail must be unchecked as "Spam". My suggestion would be to make the "add to friend" function automatically unmark the sender as "Spam" – then this tool would grow even better. So far it don’t look like the author have any other intentions than to make MagicMail even better, and a five star marking from me as it’s per today! This is a very pleasant little utility with very few bugs. It's quite nice to be able to sift through incoming mail whilst it's still on the server. Whilst it can be quite satisfying with automatic spam sorting, one can never be absolutely certain that something important inadvertantly gets deleted. The main bug that I have discovered so far is that it cannot detect that it's already running under Windows and starts a new process. That's easily fixed. Style XP is fast and uses less memory ,, I second to Qlib for what he wrote. I wish they can modify Microsoft engine so they can skin menus and other GUI's like windowblind, only then they would make windowblind out of business as for now if you have fast graphic card and like more fancy GUI go for window blind,, I will rate it 4 since it lacks the skinning ability of windowblind..
Wow! This tiny piece of sw is growing better and better! Try it - you will stick with it!